It’s morning in Virginia Beach. The steady indecision of the shifting tide sets the soundtrack for the impending tango between light and dark in the distance. The sunlight dances into your bedroom, bringing with it the promise of a new day and beckoning you to be a part of it. If the tone of the day is set within the first few hours after waking, you might as well do it right. Luckily, we have everything you’ll need to get your day started the right way in Virginia Beach. A sunrise in Virginia Beach is a sight you won’t soon forget. With the world still sound asleep, the show is about to begin with a light-show over the Atlantic Ocean - and you have a front-row seat. Watch through the dancing sea oats on the dunes of Sandbridge, as the waking sun glistens on the morning surf. 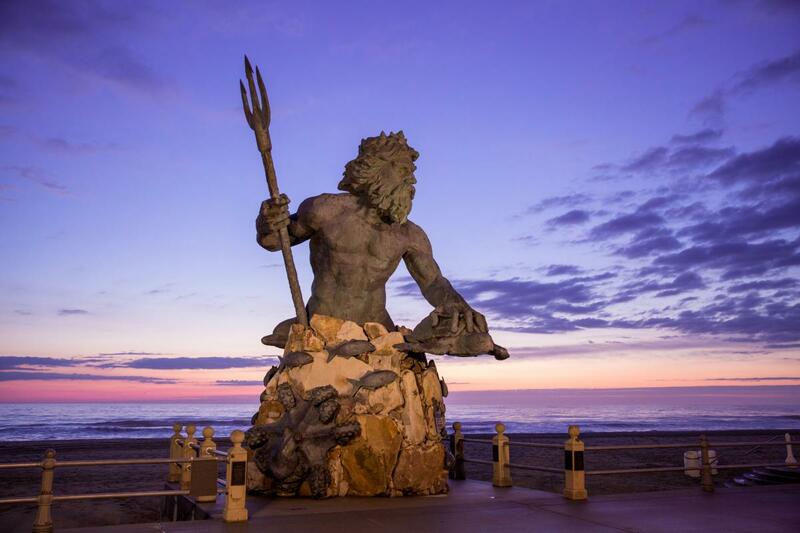 If you’re at the Oceanfront, beat the rush of the day’s first beachgoers and take in the colors of the dawn behind King Neptune or on the Virginia Beach Fishing Pier. For a hidden-jewel-of-a-view impeded by nothing but the horizon, head to Rudee Inlet, drop a paddle-board or kayak into the water and experience the daybreak by floating right up to it. Local Tip: While it may be a bit on the cooler side, it is hard to beat a sunrise over the ocean in the fall and winter months, partly because they occur later in the morning, allowing you to sleep in a little later, but also thanks to an awe-inspiring palette of colors. Whether you’re excited by the gleam of a new dawn or still coping with the fact that you’re awake after a late night out, there is no better way to begin your day than with a morning feast. 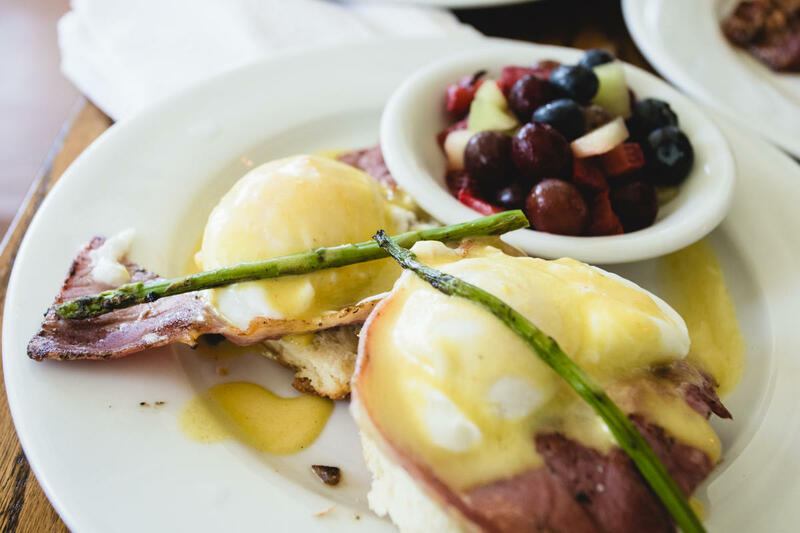 For soul-satisfying fare that gives a nod to our Southern culinary roots, look no further than the Oceanfront, where you’ll find Doc Taylor&apos;s. This one-time doctor&apos;s home serves up delicious comfort breakfast and lunch food, Bloody Marys and mimosas. This spot is such a locals&apos; favorite, that the menu features several items named for regular customers. Further south, in Sandbridge, stop by Margie and Ray’s for the Back Bay Benedict. Served with two crab cakes instead of the traditional Canadian bacon, this is a mouthwatering local twist on a classic brunch staple. Citrus, in the Chesapeake Bay district, is another must-try on your breakfast and brunch bucket list. Once featured on Food Network’s “Diners, Drive-ins and Dives,” this has been a favorite of locals and visitors alike. Try the “Citrus Style Pancakes” for a fruity morning treat. Local Tip: With menu items like fried oyster benedict and jump lump crab omelette, there is no shortage of ways to start your day with a local staple - seafood! There’s nothing quite like taking in the magnificence of a VB sunrise but, if you’re like us, there’s only one thought going through your mind upon waking up – Need. Coffee. Now. If the day can only be as good as the first cup of Joe, you might as well do it right. Just steps away from the boardwalk, in the colorful ViBe Creative District, sits a shop whose approach to coffee mirrors the artistry of its neighbors. 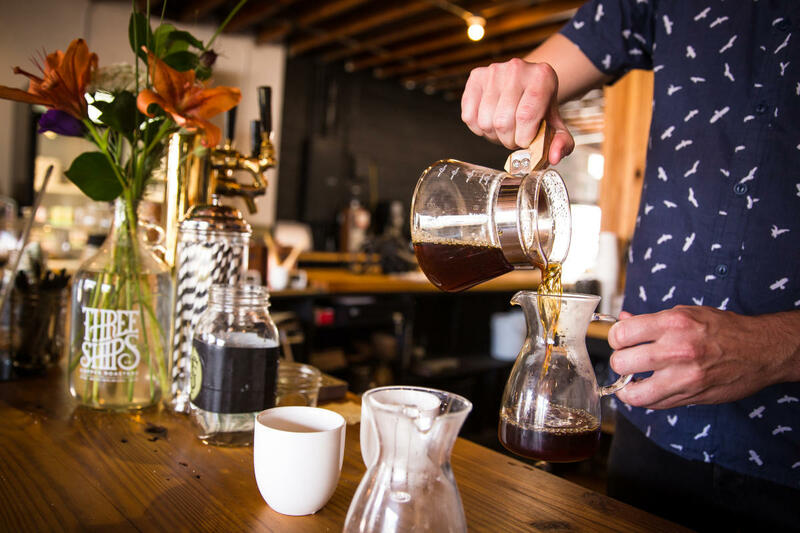 Once a mobile staple at the Old Beach Farmers Market, Three Ships Coffee Roasters, whose name pays homage to the adventurous spirit of the first settlers in the area, is carefully crafting the rich taste of their coffee by hand – from bean to cup! Down the road in the Hilltop Shopping District, Roast Rider Coffee + Tea is also serving out fresh, roasted house coffee that’ll change your perception on what coffee should be. Try it over ice with a little cream and sugar for a refreshing morning pick-me-up. For a little breakfast and coffee rolled into one, try a Coffee Date “Liquid Meal” from Fruitive, also at Hilltop. Fruitive blends cold brew coffee with Brazil nut milk, banana, peanut butter, raw cacao powder and maple syrup for a healthy start that will fill you up and give you the energy you need to take on the day. Local Tip: If you find yourself at Three Ships Coffee, try the Pungo Latte. Sweetened with seasonal berries light strawberries or blueberries from the nearby farming community of Pungo, you can’t get more local than this. Whether getting your weekend going the right way, or simply indulging on a day off, there is no morning treat quite like the revered Bloody Mary, and we have some good ones here in Virginia Beach. 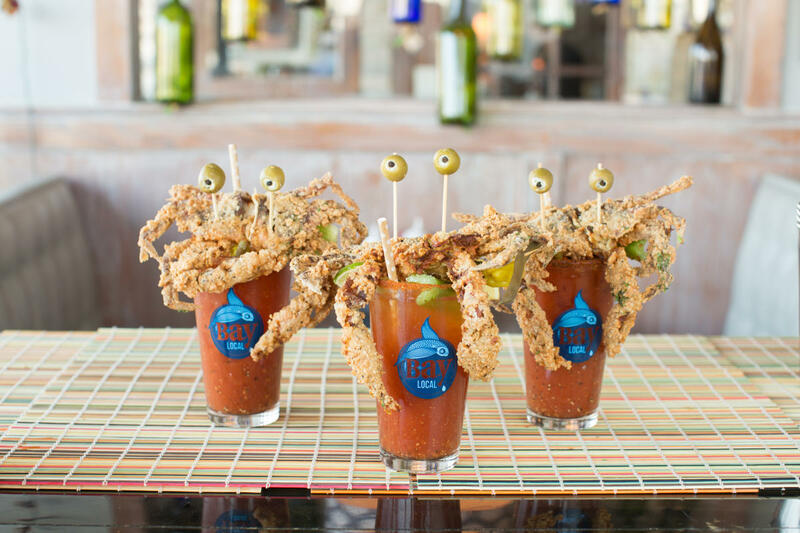 Bay Local Eatery, serving out of both the Oceanfront District and the Chesapeake Bay District, offers up one-of-a-kind take on this classic, with their “Bloody Blue.,” topped with hand-picked Chesapeake Bay soft-shell crab. Also in the Chesapeake Bay area, Brunch House and Citrus offer can’t-miss versions of this savory drink, as well. Brunch House has a green Tomatillo Mary with a citrus and spice kick that makes it easy to sip. For a more traditional Bloody with some local spice, Citrus is known for their spicy Old Bay Bloody Marys, with extra horseradish and a glass rimmed with Old Bay seasoning. Local Tip: The Bloody Blue is only offered when soft-shell crabs are in season (around May-September), so plan accordingly!